This year’s Outback trip began just 6 weeks after Kerry’s death. She wanted the already-planned trip to take place after she had gone, and so we went, albeit with a feeling of loss and sadness, but also with memories of happy times. Our first day out took us to Bourke, the second day to Tibooburra in the north-west corner of New South Wales. Much of the eastern half of the continent has experienced above average rainfall for the past few years. This has resulted in many Outback tracks being closed due to flooding or flood damage. The rain has also meant that inland watercourses have seen above average water levels. Inland lakes, albeit shallow, mean birdlife. Lots of it. 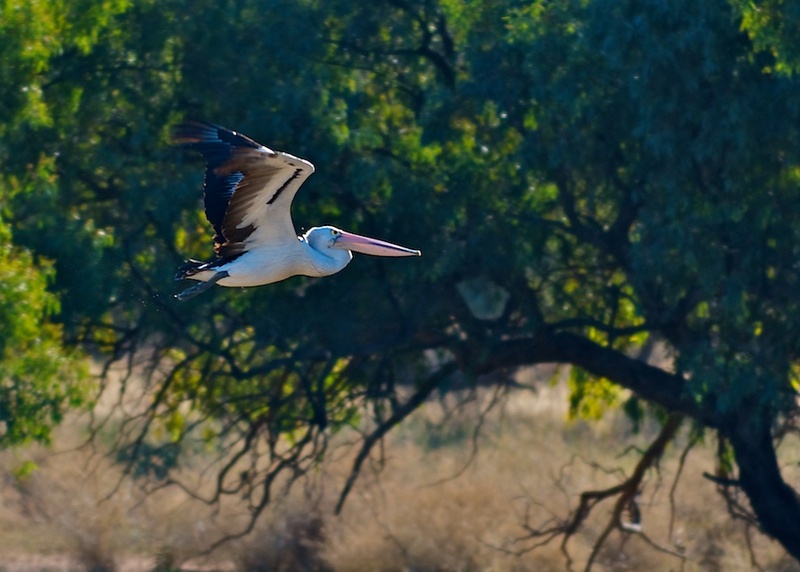 Not long out of Bourke, heading to Wanaaring, we came across channels with some of that birdlife. Here, a pelican takes off. My Mum lived at Tibooburra when she was young. I have a painting of the homestead. There is not much grass in the painting. It is lovely to think of all the grass out there now. My recent trip took me to Bourke but we went back towards the sea after that. There was certainly lots of water about.